​Service dogs are protected by both Federal and State Laws. According to the Department of Justice, Americans with Disabilities Act (ADA) a service animal is defined as any DOG that is individually trained to do work or perform tasks for the benefit of an individual with a disability, including a physical, sensory, psychiatric, intellectual or other mental disability. The work or tasks performed by the dog must mitigate and be directly related to the handler’s disability. In March, 2011, revisions to the ADA excluded all animals but dogs (and miniature horses in special provisions) as service animals. These dogs have legally defined public access rights, which means they are allowed to accompany their disabled handler in all areas where members of the public are allowed to go. Additional information on this law can be found at this link https://www.ada.gov/service_animals_2010.html. Service Dogs may travel and live with their disabled handler free of charge and it is illegal for places of business or for public accommodations to deny a team access. ​certified as a goal-directed therapy dog. Notice how the dog engages and makes eye contact with the handler. ​There is no such thing as "certification". Although some organizations that provide dogs will certify through their own organization. But, all those online websites that sell certifications are bogus and just making money off people. The only things that are needed, according to the ADA are your disability, and a dog that has been trained to perform at least two tasks to mitigate your disability. The dog isn't the one who had access rights, rather it's the individual with the disability & the dog as a team that have public access. ​​Anything Pawsable describes a trained task as; a dog must execute a command (or behavior) promptly and on cue. 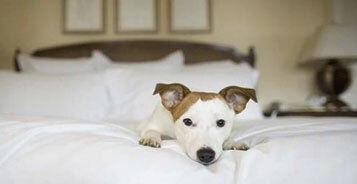 Tasks are things that a dog is trained to do reliably — exactly like sitting or going into a down stay on command. Furthermore, the training must be verified by a qualitative and quantitative method (also known as proofing). Finally, and most importantly, the trained behavior in question must directly mitigate one or more aspects of the handler’s specific disability. The behavior of the dog must happen as a response to a specific command or be automatically cued by an external — but specific — factor such as scent (such as a verified sample of excretions from body during a high or low blood glucose level also known as hypoglycemia and hyperglycemia), emotion (such as a verified emotion of fear during a night terror), sound, motion, etc. 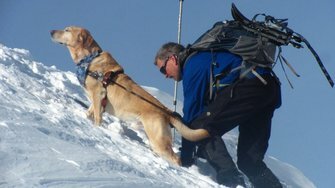 ​​Anything Pawsable goes on to say; there are no other requirements (no documentation, no gear, no certification, no registration, no anything else), and it’s quite simple: if a dog is NOT task-trained, working directly for an individual with a disability and under the direct control of the handler, it is NOT a Service Dog. ​Can I train a dog myself? From a legal stand point, you can. But it’s a risky proposition because you’ll be putting thousands of hours of training into it, and the dog may still not be appropriate. You also have to ask yourself if you have the skills to train a dog correctly. Or what will you do if your dog ends up with a medical problem. It’s hard to be objective about your own dog, so you may miss signs the dog gives you which clearly indicate he doesn’t want to be a working dog. Many dogs prefer to just stay home, rather than handle the stress of working out in public all the time. Be honest with yourself, and be fair to your dog. If your dog reacts to other dogs, has triggers, or other behavior challenges, it’s best to let him be a pet dog rather than continuously try and make him into something he doesn’t want to be. It’s your responsibility to keep yourself, your dog, and the general public safe, so try not to make excuses for why your dog growls at other dogs that get too close to him. Just admit that your dog prefers to be alone with you indoors, or in an enclosed yard or play area. Many of these type pet dogs make excellent emotional support dogs. If you still decide to train your own dog, don’t do it alone. Seek out the help of an experienced, credentialed dog trainer. They should have a background in training dogs for specific tasks, and be well versed in public access testing. ​Can any dog become a working dog? ​Assistance Dogs International (ADI) has been setting standards for the assistance dog industry since 1987. ADI is a coalition of not for profit assistance dog organizations. The purpose of ADI is to improve the areas of training, placement, and utilization of assistance dogs, staff and volunteer education, as well as educating the public about assistance dogs, and advocating for the legal rights of people with disabilities partnered with assistance dogs.